In the fall of 1995 the Lord gave me the desire to start a Cowboy Church. While traveling showing horses or preaching, I was on the constant lookout for a good location for our church. I looked in many places, ranging from Kansas, Oklahoma to Mississippi, Louisiana, New Mexico, and all over Texas. I looked everywhere; everywhere, that is, except in my own area. I was thinking in MY mind of a big city suburb area with lots of people. But God eventually showed me where and how to build our church. It was almost in my back door, 30 miles south of where we started out. 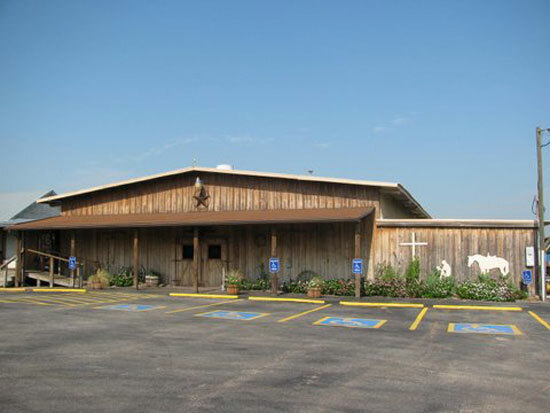 In October 1997, All Around Cowboy Church came into being in Sealy, Texas . The name of our church stems from serving all kinds of cowboys and cowgirls, ranging from ropers and rough stock riders, to arena performance people and others from all walks of life. Our church sanctuary started in a horse barn with horse stalls on each side of the church, and hay bales for pews. Since then, we have enlarged our church two times, and now have seating for over 300 members and visitors. We also have chairs for those who need more back support.